"Selah" is the name we've chosen for our daughter in Taiwan. It means "stop and reflect, pay attention, this is important..."
I can hardly get my mind around the fact that 4 months ago today we held Selah in our arms for the first time. She felt so good in my arms, yet she held herself very stiffly. The expression on her face for the first few hours was one of curiosity and mistrust. She did not cry one tear, yet we could tell she was very uncertain of her new arrangements. She must have been thinking something like, "Who are these odd looking folks I've been handed over too? Are they some new His Hands volunteers I will hang with for a few days? Will we laugh and play and have a couple bottles of milk together? Or is this something completely new...?" Selah did start to relax over the next few days. We began to see some lovely smiles and she even broke out her infectious laugh on a few occasions. She didn't have a clue who we were or why we were together, but she did seem to trust that we would take care of her. She had a long way to go, however, to begin to understand the permanent and unconditional love of a family. Selah has also started to call us "Mama" and "Dada". Oh what a wonderful sound! She only says it when she's in the mood, but when I hear that simple word, my heart sings! One other new development is that Selah is learning to cuddle--one of my favorite things to do. :) It was many, many weeks where she would sit stiffly in our arms when we held her, but now she will relax and snuggle right in. Ahhhhh... :) Our baby girl is learning about Family and Love. Thank you, God, for this wonderful gift!! ~Selah has learned to eat solid food, pretty well. ;) She is cutting tooth #9 and does a little chewing, mostly sucking and mashing her table food and some stage 3 baby food. ~Selah learned to clap...and knows what it means (i.e. "Good job, Selah!"). She loves to join in the applause at church or if she sees/hears it on tv. ~Selah is learning to wave hello and goodbye. ~Selah's sense of humor is really developing. She loves to make goofy faces so everyone laughs. She thoroughly enjoys diving her whole body onto anyone laying on the floor. And she finds it extremely amusing to try to feed her bottle to family members, or stick her paci into mama's mouth. ~She recently starting walking! Not a lot, but several steps here and there, until she realizes what she's just done and gets nervous. ;) I suspect it won't be long before we are chasing that short chubby legged girl all around the house! ~Now this is a big one. Selah is learning to sleep through the night!!! What an answer to prayer! Seriously. Going to a comfort a crying child or calm a laughing child several times a night leads to extremely exhausted parents (and big sister, who is also often awakened). It is a challenge to parent effectively, or do anything effectively, for that matter, on little sleep. So I praise God every night Selah sleeps through, or even makes it past 5:00am. We are starting to feel energy again--woot!! It's been less than 2 weeks since we were last with members of the His Hands Taiwan ministry team, but boy do I miss them. What amazing folks, with such a heart for God and a heart for the vulnerable and hurting young women of Taiwan! Please click the link below to watch the video. It gives an excellent overview of the purpose behind the ministry and how it came together. And if you are me, it will make you smile a bittersweet smile, because you wish you were back in Kaohsiung with all of the wonderful His Hands people! After The Airport...What do YOU think? This recent post by Christian author, speaker and adoptive parent Jen Hatmaker will move you deeply and open your eyes. "I'm going to tell you something; a little confession, if you will. Some of you will pull your hair out and smear your faces with ashes and put all my books on eBay and quit believing in God, but I'm willing to take that risk..."
We did visit Selah's pediatrician on Friday and thank goodness, we are starting our 10-month-old on baby food! This should mean a fuller tummy for longer periods. Which also translates to longer periods of sleep at night. Woohoo!! Dr. Jeanie is also making appointment for Selah to see a pediatric cardiologist to evaluate the hole in her heart and a poorly functioning valve. We will also see an opthamologist to evaluate her retinopathy. A dermatologist is next to help determine the cause of the mysterious itchy bumps on her head. Sometime in the midst of all this we will go to the children's hospital for blood tests - oh fuuuuun! Everything is rounded out by her 1-year physical the end of October. All in all, the pediatrician was very pleased with Selah's size and development. She may have come into this world a couple months early, but she is trucking right along now! Today before our church congregation we had Selah dedicated to the Lord. This is a very important commitment Eric and I choose to make to God on behalf of each of our children. Our children are a gift from God--in fact they are "on loan" from God and we are merely stewards of each precious soul. We strive to honor God in the way we raise our kids. Our highest aim is that 1) they grow to love God with all their heart, mind, soul and strength, and 2) that they are secure in the unconditional love of their forever family. Our children's pastor, Roberto, performed a lovely and personal ceremony. We were also blessed to have Eric's parents in attendance, all the way from Illinois. My dad was also up front with the group, but my mom, who had surgery on her shoulder that past Tuesday, was unable to make it (please pay for her pain and for a swift recovery). This is one of those special memories we will always cherish. I'm glad we got video of the ceremony. :) I will upload that later. Being first time parents to an infant (Noelle was almost 19 months when we arrived home from China) has been a very interesting experience. 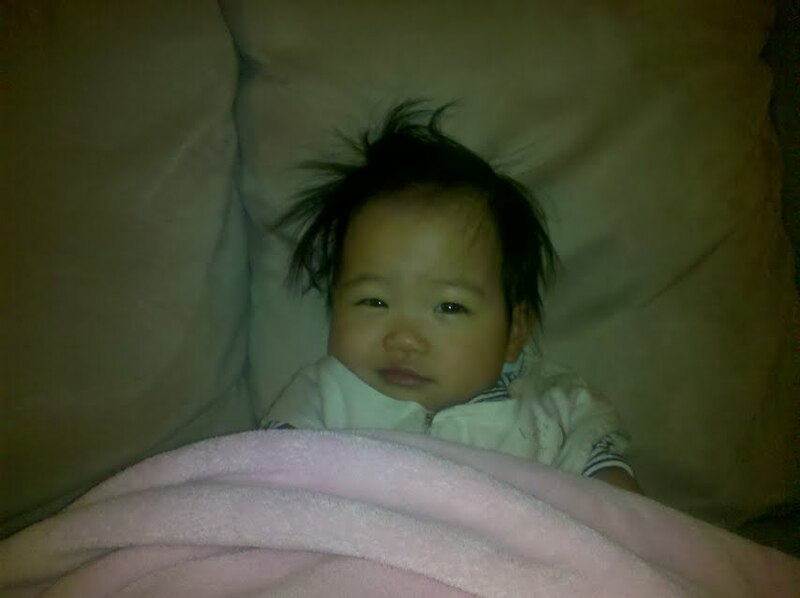 I can see that it will take a few weeks of caring for Selah's particular needs for it to become second nature. Every day does get easier than the day before. And every day we fall more in love with this second blessing God has sent our way. Regarding Noelle, we would ask that you keep her in your prayers over then next several weeks and months. She is struggling with "sharing us" with Selah. This is normal for all first siblings. However...she has been experiencing some big insecurities related to how she entered our family back in 2008. She has expressed some deep fears that have Eric and I very concerned. Only God can unravel these hurts and doubts our sweet daughter feels within her soul. Thank you for those prayers. I should tell you one very positive development. Selah totally loves Noelle. She thinks her big sis is tops and grins, giggles and belly laughs at almost everything Noelle does. Every time Selah giggles at Noelle antics, Noelle starts to enjoy having a little sister. We thank God for this connection that is starting between the two girls. In the coming days, however, I would like to share the details of our trip with you. I'd like to share our packing list, travel advice and tips, do's and don't's, hotel reviews, Taiwan must see's, fun moments, scary moments (yes, there were a couple) and moving moments (including meeting with Selah's biological grandfather). I am passionate about adoption. I am passionate about the ministry of His Hands Taiwan. I am passionate about our daughter. I am passionate about sharing lessons I've learned and am still learning. Hopefully the information will be helpful. Maybe it will encourage some. Maybe it will challenge others. So please stop by again! Saturday September 3 - We arrive in Chattanooga at 8:25PM!!! And we get to hug and kiss our daughter Noelle (who turned 5 years old today!)!!! August 25 through September 3, 2011 Trip to Taiwan August 16, 2011 We receive an email from AIT saying that our visa appointment is in 2 weeks in Taipei!!! August 12, 2011 Fingerprint clearance emailed by our immigration caseworker to the National Visa Center August 8, 2011 Drove to Atlanta USCIS and got our new fingerprints taken...3 weeks early! July 26, 2011 Selah's care package arrives at the House of Hope. July 22, 2011 Since our fingerprints expired this month, today I sent our request to USCIS to be re-fingerprinted (can't travel with expired fingerprints). July 21, 2011 We received our Final Decree!! Selah is legally ours!!! July 11, 2011 We receive a notice from the IRS that we will be receiving our adoption tax refund check (in 6-8 weeks)! July 6, 2011 Court appointed social worker conducts a home study on behalf of Selah. June 25, 2011 Received our "change of country" approval letter from U.S. Immigration. June 24, 2011 COURT HEARING!!! June 7, 2011 His Hands receives our new POA from FedEx. Their administrative assistant will use it when she represents us in court on June 24. May 23, 2011 We receive an email from His Hands about our court date--June 24th!!! We also FedEx our new certified POA to TECO in Atlanta. May 16, 2011 Our Chinese translation of the new Power of attorney document arrives in the mail from Taiwan. April 26, 2011 We mail our "change of country" application to USCIS to get our approval switched from Ethiopia to Taiwan. We start the signing / notarizing / certification process for a new Power of Attorney document. April 25, 2011 We find out our dossier has been submitted to the court to apply for a court date! April 18, 2011 Our dossier arrives at His Hands Taiwan!!! April 15, 2011 TECO'd documents arrive from Atlanta. After scanning and photocopying each"authentication page", we FedEx our dossier to Taiwan!!! April 14, 2011 TECO'd marriage license arrives from Chicago April 11, 2011 We drive to the Taiwan Consulate (TECO) in Atlanta to submit our Tennessee documents for authentication. We FedEx our Illinois marriage license to the Taiwan Consulate (TECO) in Chicago for authentication. April 8, 2011 TN SOS certified documents arrive back to us. April 6, 2011 We FedEx our Tennessee documents to the TN Secretary of State for certification. April 5, 2011 Translated home study / power of attorney / adoption contracts arrived in the mail from Taiwan!!! Got all dossier documents county certified at local courthouse. Made 2 copies of every page of all documents. April 1, 2011 Certified marriage license arrived from the Illinois Secretary of State. March 16, 2011 Finalized home study in hand!!! Emailed it to His Hands for translation, along with the power of attorney. Received an email that it was at the translator that same day! March 2, 2011 Home visit with social worker. February 28, 2011 Received our county certified marriage license. February 25, 2011 Received our notarized background checks in the mail. Received Jennifer's notarized employment letter. February 23, 2011 Went to the doctor for our medical exams and received our notarized letters. Eric received his notarized employment letter. Power of Attorney signed, witnessed and notarized. February 21, 2011 Met with social worker to discuss changing our home study back to Taiwan, including how to file immigration paperwork with USCIS. Requested our criminal background checks at local police station. Requested a new employment letter for Jennifer. February 9, 2011 Discussed the baby girl's medical file with our friend who is a neonatal nurse (the little one is a preemie). That night we emailed His Hands to accept the referral!! February 6, 2011 Received a huge surprise from His Hands-- in our email was our referral, for a 3 1/2 month old baby girl!!! January 26, 2011 Accepted into His Hands Taiwan adoption program. November 15, 2010 Received unexpected email from His Hands Taiwan that they were accepting new applicants and had sent us their application packet. November 2010 Ethiopia dossier completed, but we didn't have the funds to submit to agency. 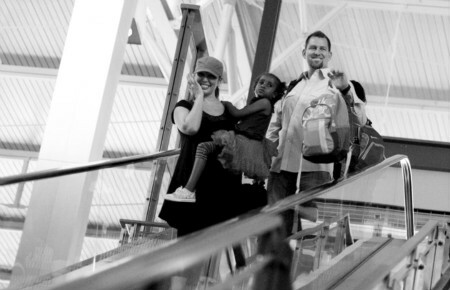 Summer 2010 We prayed about a variety of adoption options; decided to begin the process for Ethiopia. April 2010 The child on Taiwan we'd been trying to adopt became unavailable. March 2009 Began the process to adopt a waiting child in Taiwan. Fall 2008 Started discussing the possibility of adopting again. Our daughter waits for us at the House of Hope in Kaohsiung, Taiwan. Click the picture to learn about His Hands Taiwan.